Browse content similar to Tu Hwnt i'r Tymbl. Check below for episodes and series from the same categories and more! -A cold, wet morning in Tumble. -to go on the cafe's trip to Spain. -Stan takes care of the suitcases. -villagers hope for a glimpse of it. -This is a summer's day in Tumble! -Dawn, are you sitting here? -No, I'm sitting over there. -I was going to keep it for you! -is among Tumble's oldest businesses. -interest at the station's open day. -I ordered a 'People's Friend'. -Nigel mixed them all up! -Life goes on as usual at the cafe. -the customers at breakfast time. -Eight and three - eighty three. -Seven and three - seventy three. -Five and nine - fifty nine. -OK, it's another full house. -..are visiting the fire station. -This is a retained fire station. -and one is a woman. -Come over to the television. -and we follow different themes. -to find out about the fire service. -they see the officers in uniform. -That's also true of the staff! -for a saucepan to catch fire. -contents of the saucepan will burn. -throw water onto a burning chip pan. -what they should and shouldn't do. -of what you shouldn't do. -at nearby Mynydd Mawr Hospital. -..and we're finishing off here. -to build up their strength. -and they also have a home visit. -whether or not they can go home. -receive care on a daily basis. -Well done. Come on up straight. -It feels heavy, you see. -Mrs Lewis? Oh, we'll get her up now. -is a mile away, in Cefneithin. -a normal part of communities. 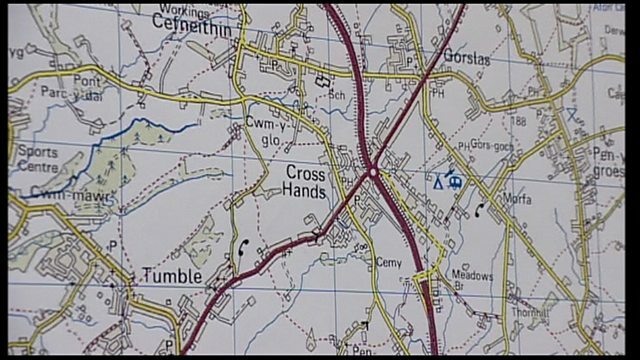 -of the Gwendraeth valley want. -as a way to get their voices heard. -and children need our services. -is the name of our annual festival. -with this year's Gwyl y Gwendraeth. -I'm sure we can reach that target. -is still on the road to Spain. -beaches and forget about the cafe. -to a kitchen for the community. -the Tumble Meals on Wheels service. -Do you have enough drinking water? -Does he still do a lot of cycling? -Glan's son and I are keen cyclists. -because I love to cycle along them. -Horeb, Pump Hewl and Cynheidre. -of the farm where I was born. -goes along the old railway. -the way to meet the coastal path. -at Mynydd Mawr Country Park. -of the lower section of the park. -to witness the opening ceremony. -of this 100 hectare site. -Whose scissors is this, then? -to Malgrat on the Costa Brava! -falls mainly on the plain! -from north Wales to Pontyberem. -because I have links with this area. -to be half south Walian! -blood flowing through my veins. -..but she won the race, somehow! -and she took advantage of it! -with people from other areas. -so we haven't seen the sea yet. -We're seeing it for the first time. -They come in all shapes and sizes. -we don't get to bed until 3am! -and spend an hour here. -to the hotel for some more drinks. -and go out drinking again tonight. -but some people are already hot! -They can't wait for the big night. -It's usually quite full here. -I'm surprised it isn't full. -We can blame it on the warm weather! -to hold a carnival this year? -You're supposed to open the meeting. -Yes, but you're the Sec! -Yes, but I haven't got the minutes! -what they want to do. -Are we going to have a carnival? -I think we should have a carnival. -What date shall we choose? -What have you come up with? -to get ready for it. -The fifteenth of July it is. -We'll dance the night away in there! -Dancing? Do you dance, Stan? -Is he mad or what? -..but the carnival team is tense. -but we're unhappy with the turnout. -There are only a few of us here. -with the people who didn't turn up. -from here and go to Gran Canaria! -A holiday after the carnival. -The Workingmen's Club is full. -are drunk on the sunshine! -can prove to be too much! Mae'r diwrnod mawr wedi cyrraedd i 71 o drigolion y Tymbl. Heddiw maent yn cychwyn ar eu gwyliau i'r Costa Blanca yn Sbaen. Some of the residents of Tumble are off to the Costa Blanca!